Lemony desserts always take us to our happy place – they’re so bright and sunny, it’s hard to not feel cheerful while enjoying them. 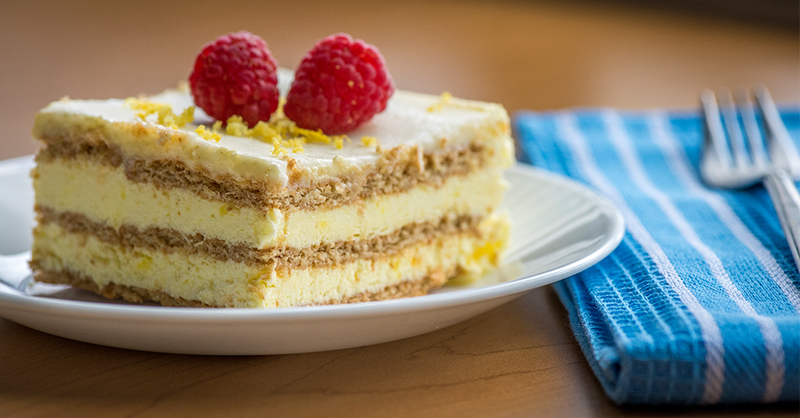 This versatile lemon icebox cake is the ideal treat to cool us down in the summer, or to brighten up a dreary day. It requires very few ingredients and minimal work, and is perfect for anytime we want to whip up a sweet treat without turning on the oven. We love the combination of cool and creamy filling with the vibrant, citrus glaze, and we bet you will too! Line a 9x13 inch pan with parchment paper or aluminium foil, then cover completely with one layer of graham crackers, breaking the grahams into smaller pieces to fill gaps. In a large bowl, combine pudding packets, Cool Whip, and milk, and pour half of mixture evenly over grahams. Add another layer of graham crackers, top with remaining pudding mixture, and one final layer of graham crackers. In a separate bowl, combine all frosting ingredients. Start with one cup of powdered sugar and add more until frosting is at desired consistency. Spread frosting evenly over cake, cover, and freeze for at least 4 hours or overnight. Remove from freezer. Slice, serve, and enjoy!